The Northeast Regional Ocean Planning Body (RPB) held an open-to-the public meeting at the Hyatt in Cambridge, Massachusetts, on January 22-23, 2014. The focus of the meeting was on approving Regional Ocean Planning goals and formalizing a draft workplan. Surfrider Foundation was present, advocating for protection of the ocean ecosystem and recreational areas, as well as provisions for robust stakeholder engagement in the public process. We also urged the RPB to identify actions for filling the data gap for non-consumptive ocean recreation interests, and we submitted a petition signed by a couple hundred fellow stakeholders from the ocean recreation community, many of whom couldn't personally attend the meeting but wanted to offer support for the process and the changes for which Surfrider advocated (many THANKS to all who signed!). Surfrider heard meaningful deliberations amongst the federal, state and tribal leaders of the RPB, as well as informed public feedback from several stakeholders. 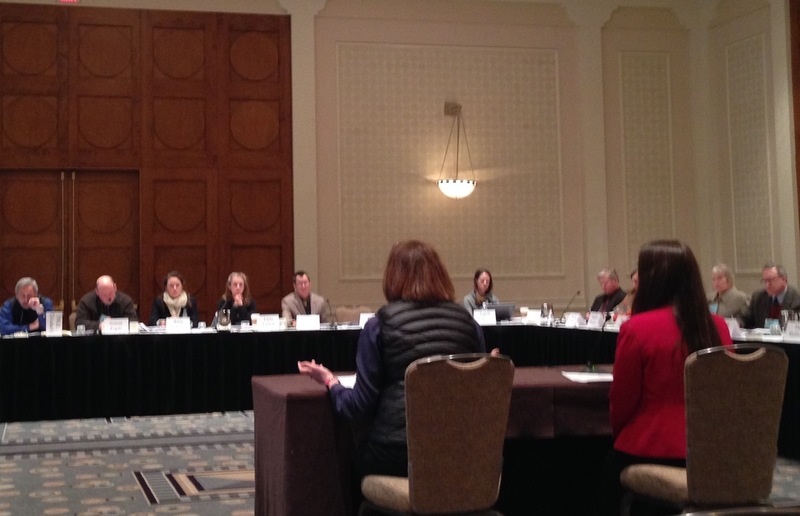 In spite of a snow storm, which delayed the start of our meeting by a half-day and added a little challenge to travel, roughly fifty stakeholders were present for the two-day meeting, including many fellow representatives from the New England Ocean Action Network. While the general tone amongst stakeholders going into the meeting was one of concern regarding changes to the draft goals and a perceived narrowing of work scope, Surfrider observed the RPB carefully considering stakeholder feedback during public comment sessions. We were impressed by the preparedness of the RPB, clearly having read stakeholder comments submitted ahead of the meeting. We witnessed the RPB listening and then integrating public comment into their discussions, and we saw changes made based upon this input. Reflections of these changes include re-ordering the goals to place the Healthy Ocean & Coastal Ecosystems goal first, reinserting the descriptive goal language into the document to help clarify intents, and adding explicit language that demonstrates inclusion of multiple interests, specifically including non-consumptive ocean recreation use, that was heretofore assumed to be implicit. We left the meeting feeling optimistic about the forward momentum of the Regional Ocean Planning process in the Northeast and more confident that the soliciting of public input is more than just a box to checkoff from an Executive Order; public input is being carefully considered and integrated. Also worthy of immense praise is the fact that ceramic mugs and washable silverware were made available for use during the meeting, rather than only offering single-use disposables; recycling bins were also distributed across the facility at the Hyatt, including in the guest rooms. Surfriders know that the reduce-reuse-recycle mantra is one of the most viable paths we can take toward helping protect the ocean and coastal ecosystems. It was a great joy to see these environmental principles woven into the fabric of this meeting, and to see many RPB members and stakeholders fancying reusable wears! Many thanks to all who participated in this meeting in person, in petition, in public comment and/or in spirit! To learn more about ocean planning & Surfrider Foundation's interests watch this short video. To see the January 2014-approved goals and framework for the Northeast Regional Planning Body, click here. Find links to background materials and opportuniies for engagement here. To visit the Northeast Regional Ocean Council's site click here.